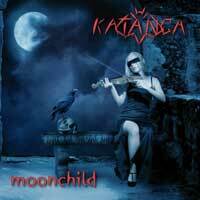 East German gothic rock/metal outfit KATANGA has been around since 1998, but this is only their second offering, excluded some EP´s and split discs. But they have been awarded some swell reviews for their previous album “Darkchild”. But with so long between releases it is quintessential that they excel with every album…do they? The disco intro of “Marquis de Sade” is no coincidence. German lyrics emphases the few words that the intro contains, and the whiplashes and groaning speak for themselves. German depressive rock puts its mark on “Mörder der Erinnerung”, or most of the album actually. In spite of the overall sound they are only four according to the info; Mario and Doreen share vocal duties, Michael handles guitars and Wilko, bass. The four of them accomplish a sort of 80´s pop, with techno touches, and dry German vocals. There is a lot of melody, and also opportunities for a duet or shared vocals. The album might be a concept album, dwelling on decadence and darkness – the Goth fans must be in ecstasy. The title track is probably the closest to metal, still featuring a laser dome inspired synthesizer pattern, a good choice. But outside of Germany and neighboring countries, it may not be so hot with lyrics in their native tongue? The German angle gets on my nerves, also the prevailing 80´s pop music, and sometimes unashamed worship of DEPECHE MODE. Bloody hell, they used to be the enemy back then… Nope, KATANGA ought to stick to the style of the title track and some of their lavish interludes and “Schwarze Flugel” or the cozy “Bittermond”. Or maybe they should opt for the more heavy style of the re-vitalized “Batflight”, or why not of all the three re-recordings. Oddly enough that trio seems the most energized and metalized, while still Gothic and interesting. I gather KATANGA can do better.